Perhaps the most intriguing and eclectic space that we offer at the Inn on Crescent Lake, the three-room Crescent Suite features all the romance and old world charm found in a 100-year-old mansion. 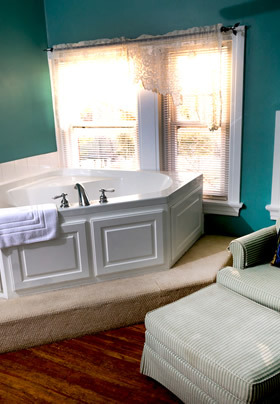 Lie back on the king-sized mahogany sleigh bed and enjoy the moonlight streaming through a skylight overhead. The separate sitting room contains an oversized two-person Jacuzzi tub in the corner by windows that provide views of the pool area. The sitting area also has a club chair, television, and daybed located in the dormer window. 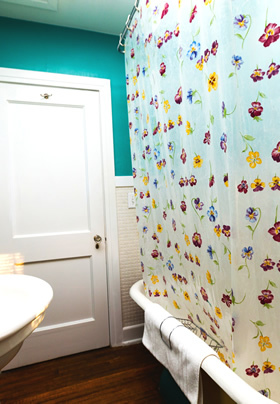 The bathroom includes the mansion’s original tub as a refurbished claw-foot tub/shower combination.